Chris Kresser: Hey, everybody, Chris Kresser here. 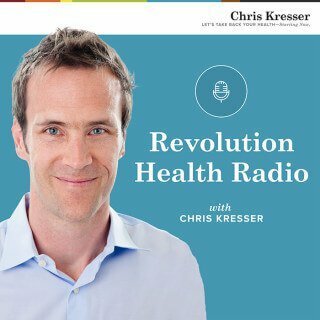 Welcome to another episode of Revolution Health Radio. This week we have a question from Tiffany. Let’s give it a listen. Tiffany: Hi, Chris. My name is Tiffany Hill. My 11-year-old son has been identified as a dyslexic learner as well as having inattentive ADHD. I too suspect that I have inattentive ADHD, given his behaviors in symptoms and diagnosis. I’m curious to know what protocol you recommend for children and adults identified as having inattentive ADHD whether through diet, supplementation, or other interventions. My son is about to go on a medication trial prescription for his ADHD and I’m wondering what your thoughts are about prescription medication as well. Thank you. Chris: Thanks a lot for sending in your question, Tiffany. You know, I get this question a lot because the incidence of ADHD has risen so dramatically over the past decade. According to the CDC, ADHD now affects 11 percent of kids, which is a 42 percent increase over just the last eight years alone. About 6 percent of kids now are taking medication for ADHD, and males are three times more likely than females to be diagnosed. This is clearly a big issue. It’s becoming a bigger and bigger problem. If you’ve been following my work for some time, then you’ll recognize right off the bat that this dramatic increase over the past eight years, 42 percent increase, could not be related to genetic factors alone because our genes simply don’t change that quickly. We know that there are some environmental factors that are contributing to this increase in ADHD. Which is interesting because if you look at conventional sources—if you do some searching on “Doctor Google” for the causes of ADHD and you click on some mainstream website links and read what they have to say, they’ll tell you that there is genetic predisposition, but otherwise there aren’t any real known causes. Some sites will go out of their way to say that diet has never been shown to be a cause. Here we have the fact that ADHD has risen in incidence by almost 50 percent over the last eight years, and on the other hand we have mainstream organizations telling us that environmental factors are not playing a significant role, at least diet, which is pretty ridiculous, in my opinion. There actually is quite a bit of evidence that suggests that diet—at least indirectly—is a major contributing factor, as well as many other environmental factors. This is yet another example of where the conventional medical establishment is out of sync even with its own research, even with peer-reviewed published research over the past 10 to 20 years that has a lot to say about what some of the non-genetic causes of ADHD may be. I think that genetics are likely to play a relatively small role in these conditions, along with every other chronic condition. They certainly play a role in terms of predisposition, and we’re going to talk more about that in a little bit. But genes are not driving this condition, and that should be obvious given the dramatic increase just in the last eight years. Okay, so I want to talk a little bit about a recent paper that was published, and I think it’s relevant to ADHD, although ADHD was not the subject of the paper. This paper was actually looking at what causes autism spectrum disorder, and it had a very interesting title. It was called “Enteric Ecosystem Disruption in Autism Spectrum Disorder: Can the Microbiota and Macrobiota Be Restored?” Of course, ADHD and autism spectrum disorder, or ASD, are not the same thing, but I believe they do share a common etiology, or a common set of causes. What they share in common is that the brain is not working properly, and the particular manifestation of how the brain is malfunctioning is different in ADHD and ASD, but I think they do share a lot of similar mechanisms, and that’s why I’d like to take a look at this paper as a way of getting into talking about some of the things that I investigate when I work with kids with ADHD. The authors talk about what they call the “biome depletion” hypothesis and a “three hit paradigm” in the paper. The three hits are: number one, biome depletion—we’re going to talk about each of these a little more in a second; number two, an environmental stimulus; and number three, genetic or epigenetic predisposition. The biome depletion hypothesis suggests that alterations of the microbiome are a consequence of our increasing hygiene and the resulting eradication of helminths, parasites, and other organisms that we co-evolved with over hundreds of thousands—if not millions of years—that help regulate and stabilize our immune system. And the loss of these organisms has been suggested to contribute to not only autoimmune conditions but also conditions like autism spectrum disorder and possibly ADHD because the microbiome works with the other legs of the stool, if you will, of the body to promote stability of the whole body’s ecosystem and immune function. The idea here is that changes to our environment disrupt the microbiome in a way that leads to a lack of immune competence. And that in turn affects the brain and can increase the risk of autoimmune disease, autism spectrum disorder, ADHD, and a whole bunch of other problems. Acetaminophen is used quite a bit in kids, and there’s actually some fairly alarming research suggesting that it can be a contributor to autism spectrum disorders and possibly ADHD via similar mechanisms. If these environmental stimuli happen at critical times during brain development early in a kid’s life, then they can have long-lasting effects. Hit number three is genetic and/or epigenetic predisposition. Obviously, not all kids have ADHD and autism spectrum disorder, even if they have microbiota depletion and environmental stimuli like I just mentioned. So why do some kids get it and other kids don’t? Well that’s where genetics and epigenetics come in. They do play a role in terms of predisposing how kids that are exposed to these triggers are going to respond. One child might develop autism spectrum disorder, another kid might develop ADHD, another kid might develop an autoimmune disease like Crohn’s or ulcerative colitis or something else. There are a variety of ways in which these triggers can manifest in terms of symptoms, and that’s determined primarily by genetic and epigenetic factors. Another interesting theory that the researchers mentioned is the propionic acid theory. This suggests that disturbances in the gut microbiota lead to increased production of a short-chain fatty acid called propionic acid. There are different short-chain fatty acids. There’s propionic acid, there’s butyrate, and they have different impacts. Butyrate is anti-inflammatory and immunoregulatory. It plays a role in supporting the immune system. Propionic acid, on the other hand, when it is found in excess, can alter metabolic and immune pathways, gene expression, and synaptic plasticity in a way that’s consistent with the findings of autism spectrum disorder and other brain disorders. Some of the people that are studying these theories, like Derrick MacFabe, who is in Toronto, I believe, have performed some very interesting experiments where they infuse propionic acid into the brains of rats or mice, and those animals exhibit behavior that is very consistent with autism spectrum disorder models. This is probably another mechanism by which disruption of the gut flora leads to changes in brain function, including autism spectrum disorder-like behaviors and ADHD-like behaviors. Then the third theory that they mention is the cell danger response. This is something that has been put forward by a researcher in San Diego, I think at UCSD, named Robert Naviaux. This refers to an adaptive response by the cell to a perceived threat. Adaptive responses are normal responses that are appropriate especially in short-term response to a particular threat. But all adaptive responses, if they become stuck or chronic, can cause problems. An example would be the stress response. The stress response is very helpful when we’re exposed to a threat because this fight-or-flight response helps us to either run away or fight if we need to when we’re faced with a stress. If you think about it from an evolutionary perspective, if we’re out on the savannah walking and we get confronted by a lion or a predator, our heart rate will increase, blood flow to the muscles will increase, oxygenation increases, all of the things that would help us to survive that immediate threat, and so that’s adaptive. That’s a smart thing that the body does. But if that fight-or-flight response becomes chronic, as it has in the modern world, where that stress system is continually activated, then something that was adaptive in the short or immediate term can become maladaptive over the long term and cause a lot of problems. The cell danger response is a similar kind of situation where you have an adaptive positive short- or immediate-term response that happens in the cell that has become chronic, and what this does is this causes changes in mitochondrial function, oxygen consumption, redox metabolism, membrane fluidity, lipid dynamics, protein folding, vitamin availability, metal homeostasis—a whole bunch of other aspects that are related to cellular function. Cells are the scaffolding of the entire body. Everything in the body is made up of cells, so if the cells are dysfunctioning, then the body’s not going to work right in the brain; in particular, it’s not going to work right. Lastly, all of these changes would be expected to affect mitochondrial function. Mitochondria, being the power plants of the cell, and mitochondrial dysfunction have been shown to be a common mechanism in autism spectrum disorders, ADHD, and a lot of other conditions, for that matter. That’s kind of a broad overview of what I think the most likely contributing factors are to ADHD at this point in our understanding. We could think of it as a kind of gut–brain disorder really. That’s turning out to be true for a lot of behavioral and even psychiatric conditions like depression, ADHD, autism spectrum disorder. Even Parkinson’s and Alzheimer’s now are increasingly thought to have a gut–brain element. This is not too surprising given what we’ve come to understand in terms of the gut–brain axis, which I’ve been talking about for many years. If you’re interested in learning more about that, you can just search for “kresser gut–brain axis” and you’ll find a lot of stuff come up there. Let’s talk a little bit about what to consider from a practical perspective for ADHD. Unfortunately, I can’t provide a protocol because the etiology of ADHD is multifactorial, which means it can have many different causes in different patients, and that’s, I think, one of the reasons it’s been hard to study. This paradigm of conventional medicine is like, “one disease, one cause,” and if you can’t find a single cause to the disease, then we don’t know what the cause is, which is ridiculous, of course. Most diseases have many different causes, and those causes can be different in different people. That’s something that the conventional medicine paradigm just doesn’t get. It’s one of the reasons why functional medicine is so much more effective for addressing chronic disease, and you’re going to see why when I read this list. On the one hand, it’s not the greatest news because it’s not easy. I can’t just give everybody a protocol that’s going to work for ADHD for every kid and adult that has it because, like I said, their causes are different. But on the other hand, the good news is that all of these fundamental factors that can contribute to ADHD are things that need to be investigated and addressed for optimal health, lifespan, and healthspan, anyhow. There are things that can be addressed in many cases without taking drugs that can alter brain chemistry and have a number of other negative side effects. There’s actually a promise here of correcting the underlying cause of the problem and being able to fix it without drugs, or at least without psychoactive drugs, that can have some pretty significant and sometimes long-lasting side effects. Nutrient status. The first thing to look at, of course, would be nutrient status. That means ensuring a nutrient-dense diet, adequate amounts of zinc, copper, choline, B12, iron, folate, vitamin A. Adequate vitamin D status is crucial and sometimes that can be achieved with diet, but in other cases supplementation will be necessary, or sun exposure. Toxin exposure. Even in the conventional world, they have recognized that toxic exposure is a contributor to ADHD, and there’s certainly plenty of research to support that, so reducing exposure to toxins in food and in the environment in general and then implementing some safe detox and making sure the detox systems are working properly is very important. I recently wrote an article with a lot of information about how to do that and we’ll provide a link to that article in the show notes. Heavy metals. Any kid who’s dealing with ADHD, I would test them for heavy metals. Particularly mercury, arsenic, lead, and cadmium can be contributors, and unfortunately, high levels in kids are quite common. We would want to identify those and get those out if possible. Gut microbiome. The gut microbiome, of course, becomes a major focus for all of the reasons that I mentioned earlier. We know that disrupted gut microbiome can cause a lot of adverse effects in the brain, and one of them that I mentioned was an increase in propionic acid. We want to identify potential issues like fungal overgrowth, parasites, bacterial pathogens, and SIBO and treat those. We want to make sure that the patient is consuming plenty of fermented foods and fermentable fibers. Short-chain fatty acids. Specifically, we want to look at the balance of short-chain fatty acids—whether butyrate levels are low, which they often are in these kids, and propionic acid levels are high. (Which, by the way, are somewhat difficult to measure. There are some stool tests that do measure production of these things, but it’s imperfect.) In a lot of kids who have these conditions, we kind of just assume that propionic acid production might be elevated and we want to do things like all of the things that we talk about to fix the gut—broth, nutrient-dense diet, fermentable fibers, fermented foods, etc., to shore up the gut flora and increase butyrate production. Specifically, prebiotics are important for promoting butyrate because they feed the beneficial bacteria that produce butyrate, like Bifidobacteria. Probiotics also can play a role, but I would say prebiotics are arguably more important in these cases as a way of increasing butyrate. Also, you can supplement with butyrate. Up until very recently, butyrate supplements have not been all that effective, especially oral supplements, because they tend to just dissolve in the stomach and not make it to the colon, where they’re needed. We have recommended butyrate enemas for some patients in some cases, and that’s more effective because the butyrate is getting to the colon where it’s needed, but that can be problematic for a number of reasons. There’s a new form of butyrate that’s coming out soon, a supplemental oral butyrate that’s encapsulated in such a way where it is released in the colon where it should be released. It’s a molecular trap. It was created by Al Czap, who was the founder of Thorne Research, which is a great supplement company. He is no longer with Thorne, but his company now is called TessMed. You can find out more about them at tessmed.com. I don’t have any affiliation with them. I’m just excited about their delivery technology, and I’ve been experimenting with their butyrate with some patients, and it does seem to have a significantly better impact than other forms of butyrate that we’ve used in the past. Antibiotics. You want to reduce exposure to antibiotics as much as possible. Of course, antibiotics can be lifesaving and necessary. I’m not suggesting they should never be used, but I’m suggesting that they should be used judiciously and wisely. Things like ear infections, doctors may often prescribe antibiotics, but if you look at the research on ear infections, many of them are viral and many of them are self-limiting, which means they’ll heal with or without antibiotics at the same rate. We can provide a link to some podcasts or articles I’ve written on that in the past. There are a lot of health issues that can be resolved without antibiotics, even though antibiotics are often prescribed. Acetaminophen. I mentioned that acetaminophen exposure has been linked with autism spectrum disorders and ADHD. Prenatal exposure to acetaminophen has been associated with hyperkinetic and ADHD disorders. There’s a lot of somewhat disturbing evidence around this, and maybe I’ll cover it more specifically in a future podcast or article because acetaminophen is obviously widely used in obstetrics and pediatric medicine. Diet. It may be worth trying, more specifically, above and beyond just a nutrient-dense diet, a GAPS or a ketogenic type of diet. In some cases, I think with ADHD you get a disrupted gut microbiota that’s producing these chemicals that affect brain function, and restricting carbohydrate and particularly starch can be very helpful in resetting the gut microbiota and reducing the production of these chemicals. You’d want to do that under the supervision of somebody who knows how to work with these diets, probably, because there are some other considerations with kids where you want to make sure that they’re getting all of the nutrients that they need and you’re doing it in a way that it’s safe. HPA axis. Another important factor would be to support the hypothalamic–pituitary–adrenal axis, HPA axis, often kind of referred to as the adrenals. Circadian entrainment is important with kids as well as adults, which means not getting too much exposure to light at night, not using their iPad in bed, for example, before they fall asleep, keeping the phone out of the room, making sure they get exposure to bright light during the day, not spending too much time indoors, managing their stress—helping them to find techniques like deep relaxation techniques or others that can help reduce stress. Kids are under a lot of stress, especially in this day and age, especially as they get into their teenage years. We often forget that that’s very important for kids as well as adults. Stress has been the biggest risk factor for mitochondrial dysfunction, which as I mentioned, is an issue in many of these cases. Mitochondrial function. We want look at other ways of improving mitochondrial function. Certainly everything that I’ve mentioned so far is important for mitochondrial function. We also want to test for any infections that might be present and treat those, so that could be any viral infections or reactivated viral infections like Epstein-Barr, or tick-borne illnesses like Lyme, Bartonella or Babesia, if they’ve had exposure. We want to look at methylation, test for methylation and treat that preferably with diet if possible but sometimes methyl donor supplementation may be required. In some cases, if addressing all of that, the mitochondrial function is still impaired, we might want to consider supplements like CoQ10, ubiquinol, PQQ, creatinine, L-carnitine, B-vitamins, all of these things, which are collectively referred to as a mitochondrial cocktail. Genetic testing. Finally, it’s sometimes helpful to do more advanced genetic testing where you look at genes. Genomics, I should say, is really the best way of approaching it. Genetics looks at single genes and their function, but genomics looks at the relationship between all of the genes, and epigenetics is looking at the expression of those genes. In some cases, we want to look at the genomic environment to see what polymorphisms they have in various genes that are known to influence brain function and be related to ADHD and that can help direct some of the diet, supplement, and lifestyle choices. As you can see, there’s a lot to consider and a lot to look at here, but I would really kind of, to summarize, focus in on nutrients, the gut that … and mitochondrial function, and really direct most of your efforts there. As you can probably gather doing this work with a practitioner who has an understanding of these systems and how to test for and treat the issues that would show up is going to probably produce the best results, but there’s a lot you can do on your own. Hopefully some of the ideas I’ve shared so far will give you a good head start. You can make some progress that way even without working with the practitioner. Okay. I hope this was helpful, Tiffany, and anyone else who has ADHD or has kids with ADHD. It’s something I’m really passionate about—helping kids with these conditions because it’s just heartbreaking to me that today is the first generation of kids that is expected to live shorter lifespans than their parents, and that’s on us. We need to do everything we can to protect the health of future generations and make sure our kids have as high a quality of life and as long of a lifespan as possible. Again, hope that was helpful. Please keep sending your questions in to chriskresser.com/podcastquestion, and I will talk to you next time. Thanks again, everybody, for listening. I’m both extremely surprised and disappointed that you didn’t mention vaccinations as an environmental trigger. I’m wondering if you’re afraid to broach the topic or what, exactly, because there is quite a lot of scientific evidence that vaccines can be a trigger for neurological injury leading to autistic and ADHD and sensory processing disorders. To mention just one illustrious scientist in this field, Dr. Stephanie Seneff has published quite a lot about the synergistic toxicity of aluminum in vaccines and glyphosate. To be afraid to mention the word vaccine does a huge disservice to parents out there and does not impress those of us who have done the real research into the real triggers of the autism epidemic. Chris, I’m beginning to wonder if you’ve been sold out to Pharma and #Monsanto. Not one single mention of Glyphosate poisoning or the toxic load with the chemicals in vaccines? How are we to support you/your group when you’ve been given a voice to help millions and thousands and you don’t even mention two major causes of the autism epidemic. This is very saddening. It’s not just diet and it’s not just antibiotics. It’s also the toxins we are exposed to. Please expand on this. Re trialing ProButyrate: it’s been notable personally on relaxing sleep bruxism as well as notable on body & brain relaxation. Unfortunately some note it dries out the skin & I’ve found sodium butyrate supps far too drying to continue. ProButyrate is the same. Will be looking into it further though. Need help, looking for a practitioner could help my child with ADHD and ODD and borderline OCD. We are located in the greater Philadelphia area and I’m having trouble finding someone trained and functional medicine that could help .